Extremely Decorative and Finely Woven Oversized Oriental Antique Persian Kerman Rug, Country of Origin / Rug Type: Persian Rugs, Circa Date: Late 19th Century – Time has a way of changing some objects in a way that makes them more beautiful than before. This is certainly the case with this palace oversized sized rug from Kerman. 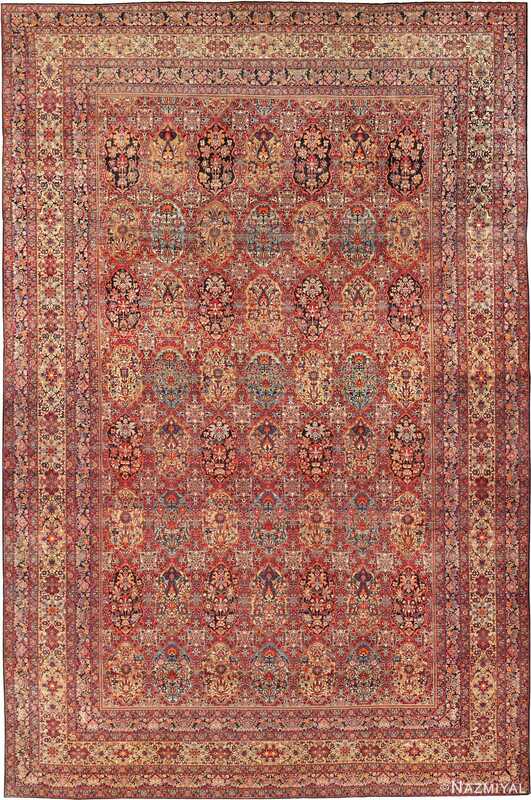 As the original colors of this magnificent antique Persian Kerman rug faded, it allowed elements of the design that were once minor details to stand out and take their place front stage. 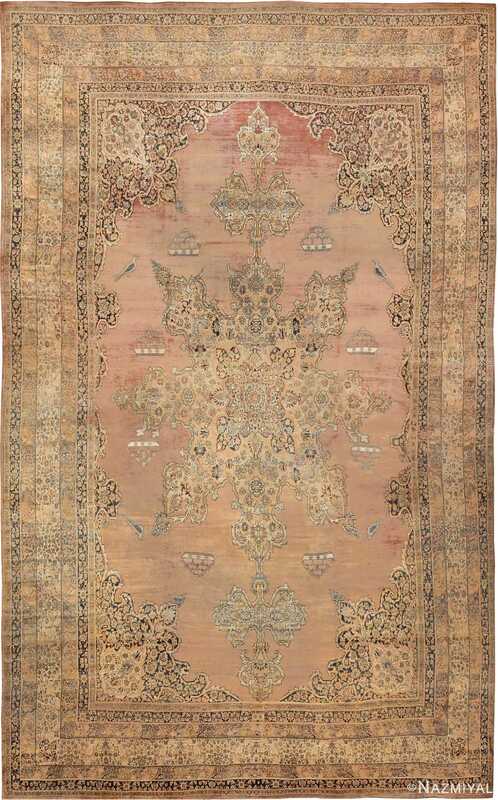 This antique Persian rug is now reminiscent of a beautiful watercolor painting that is overlaid with pen and ink. 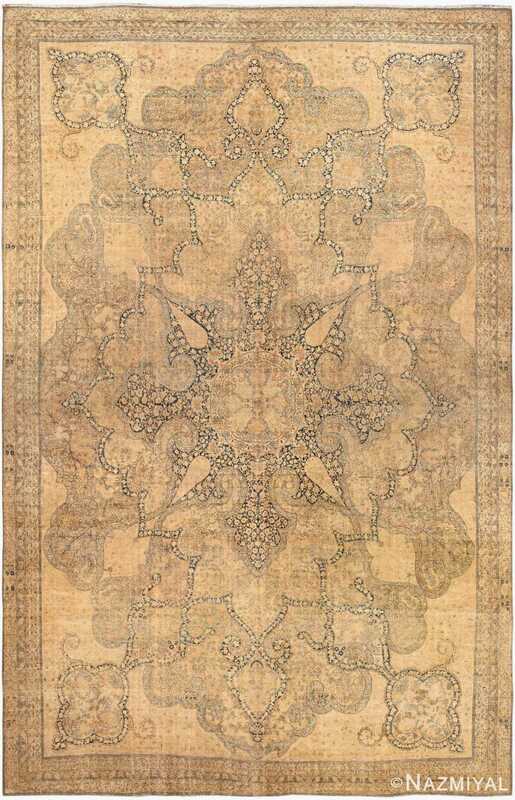 The floral palette of the finely woven oversized Oriental antique Persian Kerman rug has become tempered into dark lines. These refined lines once served as outlines for floral motifs with soft pastels appearing as if an artist touched them with a paintbrush. One can still see traces of the more saturated colors in some of the flowers. The navy blue background of the central medallion and design within the borders now takes its place as a central theme that defines the geometric as well as floral shapes and gives the design form. The central medallion of the antique rug features four magnificent cypress tree design that radiate outwards from the center. It has both vertical and horizontal symmetry, giving the overall design a sense of balance. The large size and scale of the oversized Oriental antique Persian Kerman rug are accentuated through the use of main borders that are small in comparison to the space taken up by the field. This exquisite one of a kind treasure once adorned the floors of palatial estates. 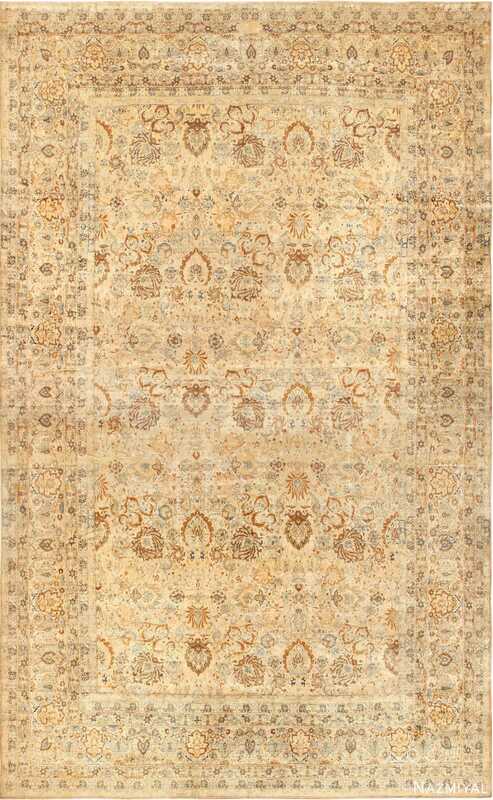 The grand scale of the antique Oriental rug will make any room look like a palace. This breathtaking and complex antique carpet stands as a testimony that time can make some things even better than before, transforming them into something that offers even more to be appreciated. This antique decorative rug deserves a place, within an interior design, where it will be treasured and honored both for the Persian rug history that it represents and the fine piece of artwork that it is today.